Remember your first slumber party? I do! We made a haunted house in the closet, played with my super cool Gizmo plush toy, and though we were cool and prank called our friends. This of course was before caller id which totally took the fun out of that game. Dora The Explorer has a new collection of episodes out on DVD perfect for entertaining a group of slumber party guests or even just great to watch before bedtime! 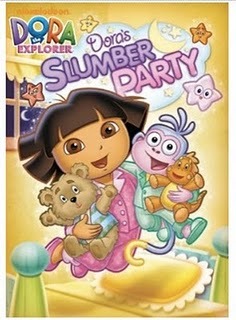 Dora The Explorer : Dora's Slumber Party is a collection of six bedtime friendly episodes. Included on the dvd are : Boot's Cuddly Dinosaur, Louder, The Lost City, Little Star, Super Babies' Dream Adventure and Dora Had a Little Lamb. Thats 147 minutes of Dora fun, more than long enough for the kids to wind down, watch some Dora and be in bed far before 9pm. Sounds like the perfect slumber party to me! Our favorite episode was Boot's Cuddly Dinosaur. Dora and Boots are having a sleepover and Boots has lost his favorite sleeping buddy his cuddly dinosaur. I can't even tell you how many times we have gone through this with Connor and his "purple bunny". Dora and Boots retrace their day to try to find where Boots left cuddly dinosaur. What I really enjoyed about this dvd though was the fact that Boots and Dora take some time out to help put a group of baby birds to sleep by singing them lullabies. It's a great episode to really get your child thinking about bedtime and it helps enforce the idea of a bedtime ritual. Actually all of the episodes included are meant to get your child thinking about some core ideas such as bedtime rituals, the difference between loud and quiet, and speaking spanish. I know that Connor really really need to work on his "inside" voice as lately it seems that kid only talks in one level and its set on HIGH at all times. You can pick up your copy of Dora The Explorer : Dora's Slumber Party right now as well as purchase on on Amazon ! Disclosure: We were given a copy of Dora The Explorer : Dora's Slumber Party free of charge, we were not compensated for this post in any other way. My opinions and comments on items we review are always my own and are never influenced by sponsors.